Targets shall be placed in portable target racks. Any willful damage to the portable target racks will be subject to review per rule #10 (in General Range Rules). All target frames must be of sufficient width to support standard targets. Target frames must be of sufficient height to have the bottom of the target at least 48 inches above the ground (see exception below). Do not lean target frames against the berms. 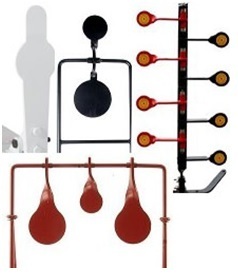 Plinking range only (10 yard pocket range): Maximum target height is 5 feet (60 inches); minimum height is 3 feet (36 inches). May use club-supplied targets on this range only, located in shed on right side of the range. 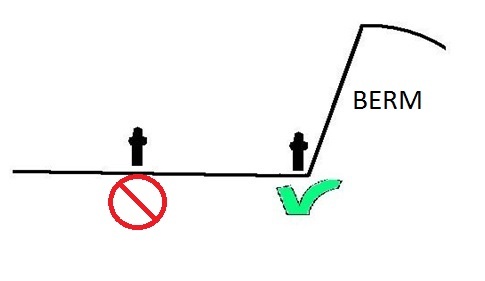 Targets must be place directly at the backstop only. Ground-based targets not allowed. Plinking range is currently closed. Targets must not be hung on any part of the portable target racks. AS OF 3/7/2017 PORTABLE TARGET STANDS ARE PROHIBITED FROM ALL RANGES. Examples of APPROVED ground targets. Examples of PROHIBITED ground targets. Examples of PROHIBITED and APPROVED ground target locations on Pistol Ranges. Steel targets must be either commercially made for the purpose of being a target; or must be a copy of such a target. Miscellaneous pieces of scrape steel or other non-traditional targets not allowed. Only un-damaged steel targets may be used. Pistol caliber and .22lr ammo only. No rifle caliber ammo allowed on steel targets in the pocket ranges. Steel targets must be at least 10 yards or more away from shooting position.